Just by existing, humans tend to pollute. However, we can all choose to do things in a more bio-friendly manner, especially manufacturers. Arlyn Scales manufactures and does all of the subassembly in-house in Long Island, New York, making it easier for us to control processes and reduce pollution. Importantly, we’ve chosen environmentally-friendly buildings and on a daily basis make “green” choices. The fact that we are sell directly to the client without intermediaries means we are closer to our client-base (mostly in the U.S.) and, therefore, drastically reduce transportation emissions and use of fuel. And best of all for the consumer, Arlyn Scales chooses manufacturing options that reduce the use of chemicals in scales when it is an adequate choice. “Our building receives a significant portion of our energy from a 50kw solar panel system on the roof,” reveals Arlyn Scales’ president, Arnold Gordon. “The main building is also super-insulated, with expanded foam and other energy-saving products,” Gordon continues in his description of Arlyn Scales’ location. Good insulation generally minimizes the energy expended to heat and cool an area, especially a large manufacturing warehouse like Arlyn Scales’. The Arlyn Scales’ administrative office requires no fossil fuels, since it is heated and cooled with a geothermal system. And last, but not least, even the cleaning products used are bio-friendly. Starting from an economic perspective, there are many direct costs related to poor management of environmental issues. Obtaining materials and shipping partially complete or fully complete products require the use of transportation systems. As the cost and impact of fuel increases, it has become more important to minimize the amount of transportation required. Follow this manufacturing chain for the housing of a digital scale for example: it might start by receiving the metal parts by truck. Some of these parts may then need to be shipped to a welding shop. After welding, they would then be shipped back to the manufacturing facility. After assembly of components, the unit might have to be shipped to a painting facility, and again returned. After electronics are assembled into the scale, it may be calibrated, packaged and shipped to a distributor. A final step could be shipping on to the final customer. Arlyn Scales, in contrast, cuts out most of this wasteful transportation. Arlyn industrial scales are designed for accuracy, ruggedness and ease of use. For the purposes of manufacturing the platform scales, aluminum plate and channel, stainless steel bar stock and plastic injection molded housings are ordered from suppliers and shipped to the factory. >>Tell us about your business and with 30 years experience, Arlyn Scales can help you find a scale for your needs and budget. The aluminum is machined in house to the required sizes and then welded together in the factory welding facility. The stainless steel bar stock is also processed in our factory machine shop. It is first cut to near final size, and then machined using CNC milling machines into the shapes required for manufacturing load cells. Strain gauges are applied to the cells by factory technicians. These load cells are then calibrated and sealed. They are attached to the welded platform. By manufacturing, welding, and doing all of the assembling in-house we cut out not only time (think about this point when you want to customize your scale) but also the use of fuel and emissions. Arlyn Scales sells their industrial scales factory direct to their customers. So the scales may be shipped directly to the end user. A significant amount of shipping and handling is avoided. Not only does this reduce costs, but it protects the environment by requiring much less fuel to be burned and pollutants to be released in the transportation process. Arlyn Scales makes many different kinds of floor scales and with each model we choose a “greener” route whenever possible. 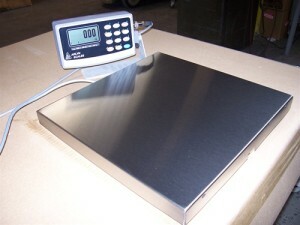 Our industrial scales, used to weigh pallets, totes, tanks and more are some of our more popular scales. Also included are platform scales and drum scales for weighing incoming packages and outgoing shipments. While they are much smaller, even bench scales, parts counting scales and laboratory scales fall within this classification. Because of the materials used, no paints are required. Circuit boards are final assembled and programmed in the electronics area of the factory, and then installed in the digital scale. This is followed by final calibration and packaging. Most industrial scales require their platforms to be painted. Besides being costly, painting procedures can release pollutants into the environment. Again, Arlyn Scales avoids many of these problems in the platform scales, and drum scales. These industrial scales are designed with diamond tread aluminum platforms and welded aluminum frames. There is no need to paint these surfaces. In those applications where there may be corrosive materials, the scales may be constructed from stainless steel. Once again, there is no need to paint the electronic scales. Even within the machining process, there may be a number of steps taken that will lower the impact on the environment. Coolants are used to remove heat and flush away metal chips from the load cell when it is being cut. While oil-based coolants have been used for many years, water-based products can be just as effective without generating as much waste that must eventually be disposed. Even this type of coolant may be further processed to remove trace oil and other wastes, so that it has to be replaced less often. This also contributes to a greener industrial scale. “When coatings are necessary-for instance on corrosion-resistant scales for wet environments or chemical scales- we use very low, or zero volatile organic compounds,” reveals Arlyn Scales’ president. Volatile Organic Compounds, or VOC’s contribute to ground-level ozone. Packaging materials will usually end up in a waste stream after the digital scale has been received by the end user. The type of packaging used can have a large impact on the nature of this waste. Plastic packaging materials are difficult to properly dispose of. Natural fiber and cardboard are much less of a problem. Typical Styrofoam packaging peanuts can also be an issue. Natural starch based materials are preferable. Don’t hesitate to contact Arlyn Scales today and take a moment to tell us about your business so we can help you find a perfect scale that will save you time, money and is a greener option.